Eight seasons in, with the episodes rapidly flying by on our way to the finale, we’d all be surprised if the creative team weren’t setting themselves some new challenges. And that’s how we find ourselves at the episode completely in iambic heptameter. Time was that folks would be satisfied with a musical episode, and folks, maybe that’s still coming. Because I think that the whole point of crazy exercises like this is to have some fun, and by so doing, inject new life into what inevitably becomes formulaic after so many years and so many episodes. The gimmick also has the annoying effect, for your humble correspondent at least, of making the episode singularly difficult to recap. There’s no particular plot; only three flashback stories, told to little Marvin by his father Marshall to lull him to sleep on the long bus ride from New York to Farhampton. There are no funny lines to quote—or far fewer at any rate, because the humor of most of the lines resides in how they are wedged into the rhyme scheme and meter. The only thing to write about is whether it works. And about that, I never had much doubt. An episode like this is written and performed as a demonstration not of humor, but of cleverness. And I love cleverness. I get as excited by how things fit together—how the jugglers keep the ball in the air, and how the pauses are perfectly timed to allow the actors to interject their two words into the narrator’s poetic flow, and how a tortured rhyme is trotted out proudly for winks and groans before a beautiful one is dropped in with no fanfare—as I do by any deep confluences of characters and themes. I love performance, above all, and this kind of episode is a showcase for the “show” aspect of the television show. All the moving parts spooling out and coming together and somehow, gleefully, like a magic trick, dropping into place. That’s Lin-Manuel Miranda across the bus aisle from Marshall, a writer and performer who has made something of a reputation by reeling off rhymes at short notice for awards-show closing numbers, even though that’s only a sideshow for his day job as a Tony-winning Broadway lyricist and composer. I don’t think it’s too outrageous to say that his spirit hovers over “Bedtime Stories,” even though his freestyling talent only breaks through in that one moment lamenting the lack of a rhyme for “Canada.” He’s worked for Carter Bays and Craig Thomas on more than one occasion—most recently writing a parody of “One More Day” for the HIMYM presentation at the TCAs—and the three of them seem to have a mutual admiration society. After so many scripts, so many lines, and so many words, why not take a half-hour simply to appreciate the pleasure of how they can fit together? 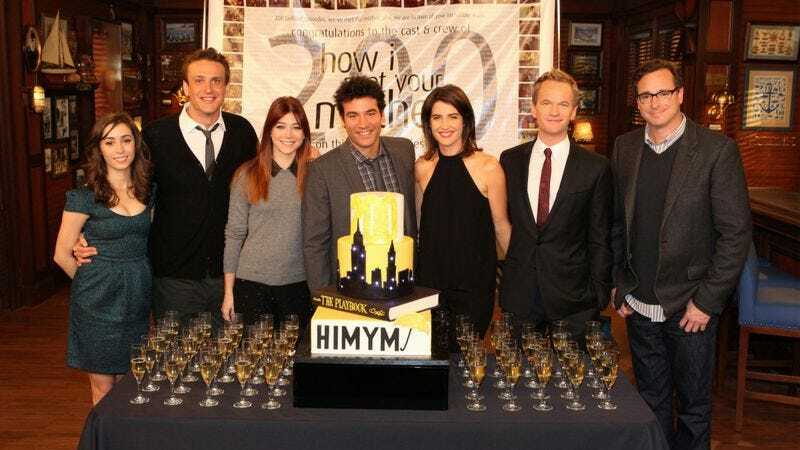 And because it’s HIMYM, this is only an additional fillip of style layered on top of the style that has long defined this show; half the fun is in seeing how the familiar interacts with the new. Case in point: In “Mosby At The Bat,” Ted responds to Lisa’s offer of dinner by musing, “What do I say?”, followed by a cut to MacLaren’s for “Teddy Westside’s got a date!” What makes that extra delightful is that the cut occurs in the middle of a line, a trick of editing and pacing to which we’re accustomed in the HIMYM house style, but that gets accented when the line isn’t just a line of dialogue, but also a line of verse. Not once but twice do ensemble members interject to Barney that nobody asked for him to accept a challenge or tell a story, with the requisite (but, this time out, slightly more rhythmic) challenge and story immediately following. The writers also get some laughs by calling attention to the difficulty of the task they’ve set themselves, having Ted speculate about a different Yankee Lisa dated every time she mentions a dish she might order (chicken Milano = Alfonso Soriano). And every time Marshall ends a phrase of narration with a colorful bit of made-up slang (Robin “batting her eyelids like a flooz”), we hold our breath to see if it will pay off with a couplet appropriate for both character and moment (in this case, her Canadian ex Simon boasting that his bride's “pad has a jacuzz!”). That music-box version of the theme is pretty darn wonderful. 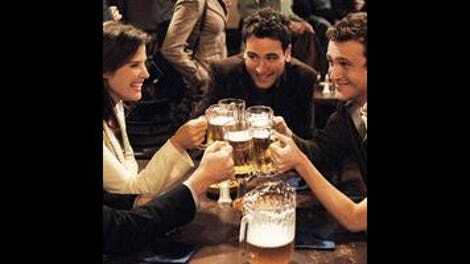 Somebody with more time and stamina than me could count up all the venerable HIMYM comic tropes that get the rhyming treatment in this episode (like the ensemble taking turns ribbing Ted for his long dating dry spell; “The last time he saw boobies was the screen-test scene in Fame,” etc.) Hell, somebody with more time and stamina than me is probably writing a recap of this episode in rhyme. I liked the bus-wide discussion of whether Rocky IV was the film Marshall referenced (“No, IV is where he talks weird because of his concussions!”) with some extra gusto because of this. The other players at the high council: Pickle Jar Bob, Bronx Donnie, Captain Bill (“I dress up like a pilot and meet girls in baggage claim”), Staten Island Lou, and the be-monocled Tuxedo Charlie.